The legendary Booker T. Jones, 70-years young son of Memphis, is a musician, producer, writer and bandleader whose influence in shaping the funky side of pop soul is as vast as his available recorded output. Best known as frontman for Booker T. & The M.G.’s (stands for Memphis Group) he owns the prestigious Grammy Award for lifetime achievement. A child prodigy who became a multi-instrumentalist in his teens, though we think of him as specialising in piano and organ – where his distinctive approach is instantly recognised – Booker T. is indelibly associated with both the Stax and Atlantic labels, for which he recorded a prestigious run of discs, including Green Onions and Melting Pot, also running up a litany of such well-loved singles as “Hip Hug-Her”, “Soul Limbo”, “Hang ‘Em High” and the UK favourite “Time Is Tight”. An R&B maestro, Mr. Jones is also associated with the highest class of band member and for his contributions to important albums by others. Donald “Duck” Dunn, Steve Cropper, Lewie Steinberg and Al Jackson Jr., all contributed to the trademark M.G.’s sound and usually performed as a unit in backing such soul luminaries as Otis Redding, Sam & Dave, Albert King, Johnnie Taylor, Eddie Floyd, The Staple Singers, Wilson Pickett, Delaney & Bonnie and countless others. As a significant sideman other Booker has played with Stephen Stills, Willie Nelson, Rita Coolidge, Bill Withers, Neil Young and Bob Dylan. The M.G.’s own status is confirmed by their position in the Rock and Roll hall of Fame and the Musicians Hall of Fame in Nashville, Tennessee. That latter geographical detail is also a reminder that Booker T. and company are immersed in country blues and rock and roll, Southern soul and Memphis folklore. Once they hit their stride in the mid-1960s their musical approach was a template for players on both sides of the Atlantic – notably The Spencer Davis Group, the Animals, Cream and Creedence Clearwater Revival – though their sound percolates through the culture and reflects their mixed black and white lineage. The master of the B3 Hammond returned to Stax in 2013 to create Sound the Alarm, follow-up tis Grammy winning (Pop Instrumental Album) The Road From Memphis, thus signalling a widespread renewal of interest in the roots of true soul. Well described as showing off his sultry organ work, a lithe rhythm section and lots of meaty horn accents — with touches that bring it comfortably into the 21st century, this release proves there’s plenty more great stuff to come from Jones. Discovery begins here. Born in Memphis, Tennessee in 1944 Booker T. Jones attended the local Booker T. Washington High School where contemporaries included David Porter (Isaac Hayes’ future writing partner), saxophonist Andrew Love (Memphis Horns) and the great soul singer-songwriter William Bell, as well as Earth, Wind & Fire’s Maurice White. At 16 Booker T. played sax on Stax Records’ first hit, “Cause I Love You” (Rufus Thomas and Carla Thomas) and would soon run into Al Jackson, Jr., and Steve Cropper – the drumming and guitar playing hombres who form the nucleus of the teenaged outfit that records “Green Onions” in 1962. The resulting album, Green Onions, was an immediate hit. The main disc made #33 on the Pop charts while the single – credited to the entire group- topped the US Billboard R&B Singles list. It’s an eclectic mix that ranges from Acker Bilk’s “Strangers on the Shore” to the stomping “Twist and Shout”, stopping off to pay homage to Doc Pomus (“Lonely Avenue’) and Ray Charles (“I Got a Woman”). Suffice to say it remains an essential listening experience. Soul Dressing (1965) and the southern soul classic And Now! move into ever more sophisticated realms, adding Muscle Shoals horns and introducing soul boys and girls world wide to the delights of Allen Toussaint’s “Working in the Coal Mine:”, the Cropper/Wilson Pickett gem “In the Midnight Hour” and a jazzier rush of standards from the Gershwins, Oliver Sain and Les Brown. In 1966 Booker T. & The MGs even conquered the tricky Yuletide set with In the Christmas Spirit (Donald “Duck” Dunn is now in the bass chair) putting some Southern soul spin on familiar wintry favorites. The Mod era ‘Hip Hug-Her’ arrived complete with Carnaby Street bedecked lovelies on the cover. Inside the tempting package you’ll find a stellar version of the Young Rascals’ “Groovin’” (another hit), Smokey Robinson’s elegiac “Get Ready” and Bobby Hebb’s instrumentally charged “Sunny”. All self produced, all brilliant. If you’ve near heard this disc you’ve missed out one of the grandest crossover R&B albums of all time. It was mandatory listening in the Summer of Love and should still be so today. The spine-tingling Back to Back dates to the 1967 Stax-Volt European tour and features The Mar-Keys (Booker T. et al with Wayne Jackson/Andrew Love’s horn section) on a few cuts and the MG’s alone on the rest. Interestingly, they repay a compliment to Spencer Davis Group’s “Gimme Some Loving” and churn up the audience on Rufus Thomas’s “Philly Dog” as well as solid revue versions of “Green Onions” and “Booker-Loo”. The standard doesn’t waver in this decade and Doin’ Our Thing showcases the band entering into more progressive territory on such of their era cuts as “Ode to Billie Joe”,”You Keep Me Hanging On” and “Let’s Go Get Stoned” - the latter tracks nodding at the fraternity and sorority of artists in the Motown stable. They also preempt the Philly soul movement by jumping on Gamble and Huff’s “Expressway (To Your Heart)” and dig the scene that is Sonny Bono’s cult classic “The Beat Goes On” – a club hit in every era from Northern Soul dance floors to Deep House raves and Acid Jazz parties. 1968’s Soul Limbo is another 39 minutes of bliss. Well known to folks in the UK for the Test match Special theme – “Soul-Limbo”…. that is by no means typical of an album including “Hang ‘Em High” (title music from the soundtrack of the movie of that name), Beatles cover Eleanor Rigby and Jimi Hendrix’s “Foxy Lady”. That these disparate pieces slot right next to R&B/soul glories like “La-La (Means I Love You)” and “Born Under a Bad Sign” is an indication of the musicians’ airtight brilliance. The gritty urban soundtrack album UpTight (1969) is an early example of the breakdown groove, long before that became a modern mixer’s go-to device. Recorded at Stax Records’ studios by Ron Capone with Jones, the tracks were overdubbed and mixed in the funky Ardent Studios – just as the power pop cult act Big Star were moving their gear in – their leader Alex Chilton of local Box Tops fame being another huge fan of the local legends. The group sign off the 1960s with The Booker T. Set, a psych hybrid of soul, pop and rock that is downright weird enough to repay playing today. When the songs come from the pens and charts of R. Dean Taylor, Sly Stone, The Doors, Paul Simon, Beatles, Bacharach & David, Ashford & Simpson, the Isley Brothers and Jesse James’ ’68 radio smash “The Horse” chances are it’s going to be either a massive success or a total mess. Luckily, it’s the former. Dig out a copy and impress your friends. 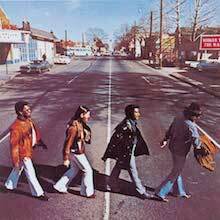 Even more bizarrely brilliant is McLemore Avenue, Booker T.’s homage to The Beatles’ Abbey Road. Covering that album in its entirety wouldn’t suit most acts but this groundbreaking tribute (the kind of thing that is fairly common these days, but was unheard of in 1970) pulls off the conceit. Check it out for the Stax Remasters bonus where the compilers add other Fabs tunes done a la MGs – “You Can’t Do That” and “Day Tripper” among them. A sublime music decade making draws to a close with 1971’s Melting Pot where the outfit returns to R&B roots while adding a heavy dose of instrumental crossover jazz-rock. A funky gas throughout this disc is more akin to the emerging sounds of funkateers like the Crusaders and Phil Upchurch. The tracks are longer and the moods are darker, reflecting the members desire to move with the times and throw off the commercial shackles of hit-dom. Obviously there are myriad compilations to discover. We recommend Stax Profiles and Time Is Tight – the latter being a comprehensive and fascinating overview on 3-CDs. Booker T’s solo output also gives us Booker T. & Priscilla, Home Grown, Try And Love Again and the jazzy moods of The Runaway. Sound the Alarm brings us bang up to date with Booker T. and guests like Kori Withers, Vintage Trouble and Gary Clark Jr. The stand out title piece features Mayer Hawthorne, the DJ, rapper and multi-instrumentalist whose own disc How Do You Do made waves in 2011. Always a man at the forefront of the movement Booker T. Jones continues to create music that is ripe for discovery. Any era is worth consideration but if you start at the beginning and keep moving you’ll find that while time may be tight it’s elastic enough to spend in the company of this extraordinary artist. 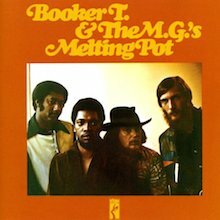 Melting Pot could be the most well-realized of all the albums by Booker T. & the M.G. 's, a smooth and soulful, yet expansive 35 minutes of all originals, the latter in sharp contrast to their exploration of the Beatles' Abbey Road album material on their preceding album. And the irony was that it was their swan song. Booker T. Jones, in particular, was increasingly unhappy working at Stax/Volt Records, owing his feelings to management and structural changes at the company, and also felt the need to change the group's formula somewhat. Steve Cropper was playing lots of session work that was keeping him from recording in Memphis as well, and the result was an album recorded mostly in New York City, far away from Stax/Volt and largely built on the group's (especially Jones') best impulses. That said, Melting Pot managed to be a sort of back-to-the-roots effort in the sense that they were back to doing originals, but was also a strikingly more expansive record, with Jones in particular playing with an almost demonic intensity and range, backed ably by Donald "Duck" Dunn's rocksteady bass in particular. There were a few other touches, such as the wordless chorus on "Kinda Easy Like" and extended running times, showing the group stretching out on much larger musical canvases. 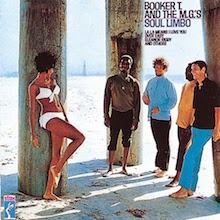 This 1968 album found the Memphis instrumental group running through the usual batch of then-current soul hit covers ("La La Means I Love You," "Be Young, Be Foolish, Be Happy"), pop tunes ("Eleanor Rigby," "Foxy Lady") and hits like "Hang 'Em High" and the title track in their own trademark style. Most interesting are the tracks where Booker T. switches over to piano and the band suddenly becomes a very jazzy outfit, like "Willow Weep for Me" and "Over Easy." One of the better albums in their discography. 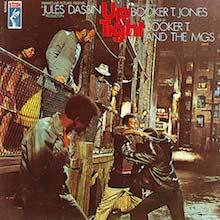 Through the score of Booker T. Jones, the soundtrack to the 1968 Jules Dassin movie Uptight reflects the story of a young black man living in the ghetto during the turbulent time after the assassination of Martin Luther King, Jr. Containing the hit single "Time Is Tight," the soundtrack moves from soft and contemplative ("Children, Don't Get Weary") to driving and urgent ("Run Tank Run"). Though not one of Booker T. & the MG's' better albums, Uptight does contain the always exemplary musicianship that the MG's brought to their records, and it predates both the Superfly and Shaft soundtracks by three years. 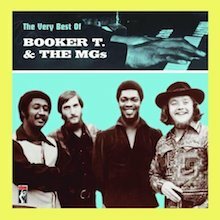 It's impossible to imagine Southern soul existing at all without the powerful input of Booker T. & the MG's, one of the grittiest and most precise rhythm sections in the history of pop music. The MGs were the house band for Stax Records and its imprints Volt and Chalice, and played on virtually everything the label released, backing Otis Redding, Sam & Dave, Wilson Pickett and any other Stax artist one can think of, and managed as well to release 23 singles and 11 albums under their own name between 1962 and 1971. The core lineup included keyboardist Booker T. Jones, guitarist Steve Cropper, drummer Al Jackson, Jr., and bassist Donald "Duck" Dunn (Lewis Steinberg was the bassist for the first two years, replaced by Dunn in 1964), and together they managed to sound both loose and offhand while still being tight as a piano wire, turning out seemingly effortless and bottomless soul grooves. This set has the obvious Stax highlights, including the classic "Green Onions," "Hip Hug-Her," "Time Is Tight" and several others, and it essentially duplicates Rhino's 1994 release that sports the same title. The liner notes to the package are brief but informative (one learns that Booker T. did not play on "Boot-Leg," for instance, since he was away working on a music degree at the University of Indiana when the tracking was done and was replaced for the session by the one and only Isaac Hayes), and while this set isn't that different from several other "best of The MGs" albums on the market, it hits all the right notes in all the right places, and that should be the tagline for this band: they hit all the right notes in all the right places. And they did it, time and time again, with soul.